It's possible to add information from Formidable View? Home › Forums › Pre-Sale › It's possible to add information from Formidable View? This topic contains 1 reply, has 2 voices, and was last updated by admin 9 months, 1 week ago. 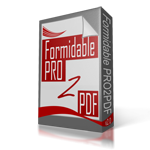 I have a pdf file with fields, and I want to fill out with data from Formidable View’s. Can I make custom fields with shortcode (like most popular selected answere) and set a field lik the shortcode? Use the Formidable:Dynamic option found at the bottom of the Webform Data Field ID on the field map layout. When selected, you can enter a view shortcode (or any other Formidable shortcode) as well as ASCII characters (text, spaces, line feeds). However, there is NO HTML functionality. Then, map the Formidable:Dynamic to a PDF text field set to “Multi-Line”. Reply To: It's possible to add information from Formidable View?